Investigation of The Dry will incorporate multiple lines of evidence to learn as much as possible about what life was like for the African American homesteaders who made The Dry their home. Information gathered from archaeological surveying and excavation will be combined with descendant oral history interviews and documentary sources to paint a more complete picture of life at The Dry. The project is made possible through collaboration between the University of Denver and Avalon Archaeology, LLC, and has been generously funded by the University of Denver and the Colorado State Historical Fund. Special thanks to Southeast Colorado Resource Conservation and Development for their assistance. Michelle Slaughter is a historical archaeologist and the principal of Avalon Archaeology, LLC, a woman-owned, small business that she founded in 2007. 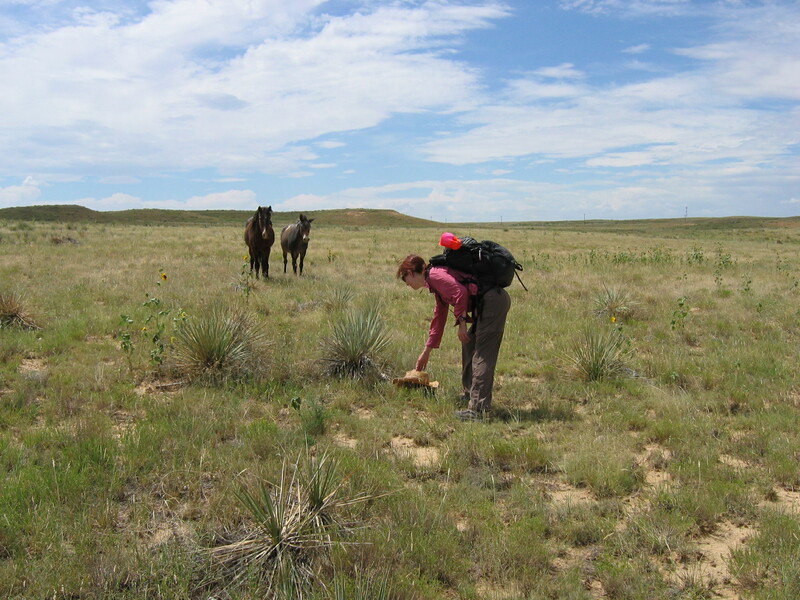 Her experience includes all phases of archaeological project management and planning, historic archival research, ethnographic research including oral histories, archaeological Class I overviews, Class II and III surveys, archaeological documentation and assessments, GPS-based site mapping, archaeological monitoring, historic artifact analysis, test excavation, Native American consultation, and report preparation. She is proud to have worked at four of Colorado’ s Most Endangered Places, all of which have been saved (the Bradford-Perley House in Highlands Ranch, Camp Amache in Southeast Colorado, the CFI Plant in Pueblo, and the Hutchinson Homestead in Salida). Projects have taken her to various cultural/geographical areas across Colorado, Wyoming, Utah, South Dakota, Kansas, Oklahoma, Arizona, Texas, Washington DC, Northern and Central California, Washington State, Peru and England, but she works predominantly in Southeast Colorado and the Upper Arkansas Valley in central Colorado. She is a committee member for the 2020 Plan to Advance Preservation in Colorado, Statewide Preservation Plan, she is President-elect of the Colorado Council of Professional Archaeologists (CCPA) as well as a member of the Resolutions Committee, is a past board member of the CCPA (2009-2011), and is a member of both the Society for Historical Archaeology, and the National Trust for Historic Preservation. Funded by a Colorado State Historical Fund grant, she started work at The Dry with colleague Dr. Dores Cruz in 2010, and is constantly fascinated and excited about all that they continue to learn during this very important project. Her favorite aspects of being an archaeologist are the day-to-day surprises associated with owning her own business, researching new places and people, and being able to travel and meet so many history, archaeology, and preservation-minded folks and having the opportunities to talk to them in-depth about their community’s or family’s history. Dr. Cruz joined the Department of Anthropology at the University of Denver in 2009. She is a professional archaeologist with cross-disciplinary interests within historical anthropology, including the close links between the more traditional fields of ethnography, archaeology and museum studies. She deals particularly with issues of colonialism, material culture, landscapes, construction of memory and representation. Dr. Cruz’s current research investigates the materiality of the colonial experience as manifested in Portugal and Mozambique (Southern Africa). Although drawing on a broader period, it focuses particularly on the Portuguese colonial period (19th and 20th centuries, with special emphasis on the Estado Novo, 1926-1974) and Mozambican post-colonial period, with references to pre-colonial times. Her goal with this research is to contribute to the definition of colonial interactions in the context of memory and landscape analysis, to conceptualize Portuguese colonialism and its post-colonial consequences, as well as to add the discussion on the reification of collective memory and its conceptualization as a process. Her teaching and research are informed by a broad Africana perspective (that is, a more international perspective that includes past and present African experiences in and outside Africa), therefore Dr. Cruz is interested in the archaeological potential of “The Dry,” and what the site can reveal about the African American experience in Colorado in the early twentieth century. Jennifer is a graduate student at the University of Denver getting her degree in Anthropology with a concentration in Archaeology. As an undergraduate she double majored in German and Archaeology at Baylor University. She has done fieldwork through Baylor at a prehistoric Native American campsite, and through the Texas Archaeological Society at a historic military depot. Her work right now at The Dry is focused on the development of the identity of an African-American homesteader in terms of community, gender, and race, and how that manifests itself not only in the material objects, but also in the use of space. She will be using ground-penetrating radar for this project, which transmits signals into the ground that detect subsurface features without excavation. After graduating she hopes to work for a few years before pursuing her doctorate and becoming a professor. Mary is a graduate student at the University of Denver, getting her Masters degree in Anthropology, with a concentration in Archaeology. Her current research is focused on the town of Dearfield, an early 20th-century black town in northeastern Colorado. She hopes her work at The Dry will give her a better understanding of life on the plains for these black pioneers. Jess is a graduate student at Brown University, working on her Master’s degree in Public Humanities. As an undergraduate she studied historical archaeology, with a focus on African American life during the colonial period. She is interested in exploring the ways that anthropology, archaeology, and history intersect in the public interpretation of the African American experience. Her career goal is to find new ways to challenge the public in their understanding of the past, by assisting with the development of critical thinking skills and encouraging social justice. Jess has worked at historic house museums, anthropology museums, and recently assisted in developing exhibit content for the National Museum of African American History and Culture.